I did not anticipate this, but since my retirement in June 2017, I have spent more time on the road than home. Such a life was always a fantasy of mine, but I never expected it to become reality. And now that it is reality, I am surprised to find it even better than I had visualized it. What I call “windshield time” is a great clearing out for me, perhaps in ways that Buddhists speak of their experience during zazen. My daily reading recently has taken me back to Jack Kerouac’s On the Road. I really don’t know how many times I have read the book myself (at least twice), but I have had the audio books read to me countless times over the past ten-plus years. But now I am reading the original scroll for the first time, and after about fifty pages, I must say that the experience is much richer than I had imagined. 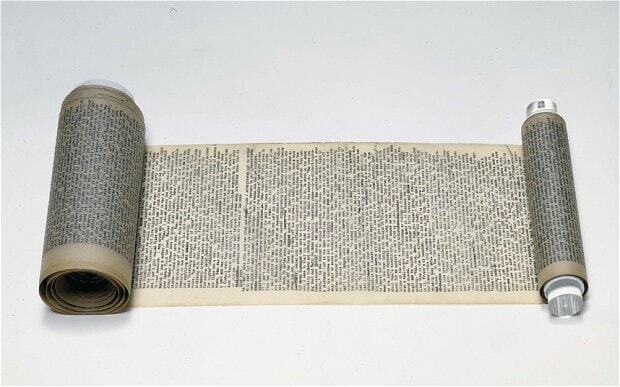 Kerouac’s original manuscript was typed on a continuous roll of paper like one would obtain from a teletype office. I actually saw this scroll on display in recent years at an exhibit in the Harry Ransom Center at the University of Texas in Austin. Reading the continuous text with no paragraphs indeed reads more like a stream of consciousness piece of literature. And I got the sense of the narrative unrolling much like the highway does in front of me when I am actually on the road. Whether I am reading (or rather, trying to read!) James Joyce’s Ulysses or Kerouac’s On the Road, I am thrilled at the sense of odyssey and adventure. After teaching my morning Logic class at Texas Wesleyan University, I’ll travel the two hours across the wide-open countryside to Palestine, Texas to gather my art work from The Gallery at Redlands to load into the Jeep for tomorrow’s set up in Bullard, Texas (an additional hour’s drive). I am fortunate that I get to stay as a guest tonight in the historic Redlands Hotel. In the morning, I’ll enjoy “Kevin and Marc in the Morning” as Smooth Rock 93.5 FM shares studio space in the gallery with me. After the broadcast, I will travel to Bullard to set up, and then Saturday spend the day at the art show. I’ll be grateful for that extra hour of sleep when the clocks change Sunday. In the picture at the top of the blog, I have included a new collage of Kerouac that is still in progress. At the Genny Wood Show, I will be bringing out collages, a medium I have not displayed and sold for a number of years now. Yesterday, I picked up an extra print bin from Pro Panels in Irving, Texas that I will take out of the box tomorrow and set up with a host of collages of Kerouac, Whitman, Emerson, Proust, Tillich and many, many more. As I posted in yesterday’s blog, I am finding new life and inspiration as I make collages of the creative spirits who fuel my imagination on a daily basis. I am back at my own desk at home this morning, preparing for my Logic class, but my heart is still beating in Palestine. The weekend was filled with great moments, as I enjoyed my new friends, Kevin Harris and Marc Mitchell, while they hosted the Hot Pepper Festival. Spending the entire Sunday in the old country store was also a profound blessing, especially watching the deer come out in the evening to graze. Yesterday was a labor intensive Monday, as I rearranged the gallery yet again and took down all my art work in the lobby of the Redlands Hotel. Weekday morning hours in the gallery are always electric, as “Kevin and Marc in the Morning” pulsates just twenty feet to my right, in the same gallery. The fellows surprised me by calling me over to the microphone twice this time. I never know what will happen when I sit at the broadcast table with them. I wish everyone could experience firsthand the dynamics of a live radio broadcast. Now it is back to my other job–teaching Logic at Texas Wesleyan University, the institution that has been so good to me since the year 2000, providing adjunct contracts that help keep my mind sharp. Nietzsche wrote of the dual forces of Apollo and Dionysus that work in our psychological makeup, with Apollo representing order and Dionysus providing spontaneity (many like to speak of left brain/right brain issues). With my art and passion and overall lifestyle, I have been closer to Dionysus, often feeling more disorganized and undisciplined than creative. Yet, Apollo has had his say in many of my life skill disciplines as well, and most particularly, teaching Logic, with all its inflexible structures. This morning I will introduce the Traditional Square of Opposition, credited to Aristotle. I particularly enjoy this part of the semester, and appreciate the positive attitude of this semester’s students. And of course, a ton of grading will be waiting for me once I return home from class. But . . . by bedtime, all of this will be completed and tucked away. Meanwhile, I continue to seek quality in the day. It was the most words Frank had ever heard Mr. Odom speak at once. He looked drained, as if he had used up a week’s worth of language and here it was only Monday. Unusual for me to open my blog with a meditation on radio. But my life has entered a new zone since Smooth Rock 93.5 FM became my new roommate yesterday, broadcasting live in the mornings from The Gallery at Redlands. My habit has been to rise at 7 a.m. every morning and go through my ritual. Yesterday and today, I set the alarm for 5:00 so I could be showered, dressed and have breakfast and coffee ready before Smooth Rock began live at 6:00. Live streaming them from my laptop and opening their Facebook page has added a new dimension to my mornings. I posted the hilarious statement above from Keillor’s book, because (for me) over 90% of radio traffic is a diarrhea of words that I choose to avoid. I won’t list the plethora of stations and personalities that ruin my disposition by merely recalling them. But that is not where I am right now. Before I go any further, I should mention that I have met Kevin Harris and Marc Mitchell of “Kevin and Marc in the Morning.” I enjoyed their company for days while they were setting up their gear in the gallery, had meals with them, and above all, thoroughly enjoyed every conversation we had. I knew them before I heard them on the air. I am not surprised at their depth of knowledge pertaining to radio history and broadcast trends–that would be expected of men in their profession. What I enjoyed thoroughly was their genuine grounding while discussing ideas and life in general–nothing superficial about these men. I could spend an entire day with either or both of them in earnest conversation without repeating anything or running out of things to discuss. Now to get to the point of this blog: radio and solitude. For me, radio at its best has been a companion during times alone throughout my adult years. In the late 1970’s, I went to graduate school in Fort Worth daily, and welded at POCO Graphite in Decatur during any shift that could be wedged into my schedule. I recall a frigid winter when I reported to work at 5:00 a.m. I knew it was time to fire up the welder when the radio in the shop played Connie Smith singing “Clinging to a Saving Hand” thus signaling the end of one radio show and the beginning of a new. The radio had to be turned off, because it was time to go to work. But the morning routine included listening to the dusky voice of Connie Smith singing those meditative lyrics. That moment of the morning ritual meant something special to me. During the academic year 1985-86, I lived in Fort Worth, but commuted early mornings one hour to Denton to teach as an adjunct for the first time in my life at the University of North Texas. I taught Introduction to Philosophy both semesters, and that was a life-changing year, the hinge between life as welder/graduate student and one as teacher. I had no idea that I would follow that teaching path from 1985 till now. Every morning during the commute, I tuned the car radio to KEGL 97.1 to listen and laugh along with Stevens and Pruett. For one hour every weekday morning, they were my car companions, taking my mind off the anxieties of teaching and letting me laugh as well as think about things that mattered at the time. One morning in March, I tuned in and was dismayed to find a trio of broadcasters I had never heard before. Stevens and Pruett had taken their show to Houston, and of course, we couldn’t radio stream in those days, so the best part of my morning commute was over. I couldn’t find another FM radio station to replace what they had given, so my radio went silent. I was dismayed this morning when researching this duo to find out what became of them. Both are deceased, Mark Stevens in 2010 and Jim Pruett in 2016. And Stevens had suffered from Alzheimers. I felt the same profound sadness that I felt the morning I received the news that Andrew Wyeth had passed away. Sad, because nothing new will come from these creative, engaging individuals. Fortunately they leave us with memories, but still, I am saddened that their creative run has ended. I write and speak of this frequently–my life has been one lived largely in solitude, and I don’t offer that as shameful confession or reason to be pitied. This is how I seem to have been made, and have lived out sixty-four years of it with no regret. I love and value relationships. I have always enjoyed the public dimension of life as a teacher. But solitude is the core of my existence, and during times that I am alone, I gladly read, write, make art, and engage in activity that I don’t find easy to do when in the company of others. And during the daily hours of solitude, I have found much enrichment in reading what others have written, and sometimes watching something on TV or listening to the radio. So . . . I salute this new friendship I’ve been offered from Smooth Rock 93.5, and am grateful now to know Kevin Harris and Marc Mitchell. For the past two mornings, “Kevin and Marc in the Morning” have brought something pleasant into my morning routine at the desk. As the music plays and they weave in their talk format, I find a satisfying rhythm while I do what I do (this morning writing this blog and printing off a quantity of my greeting cards for an upcoming art festival).